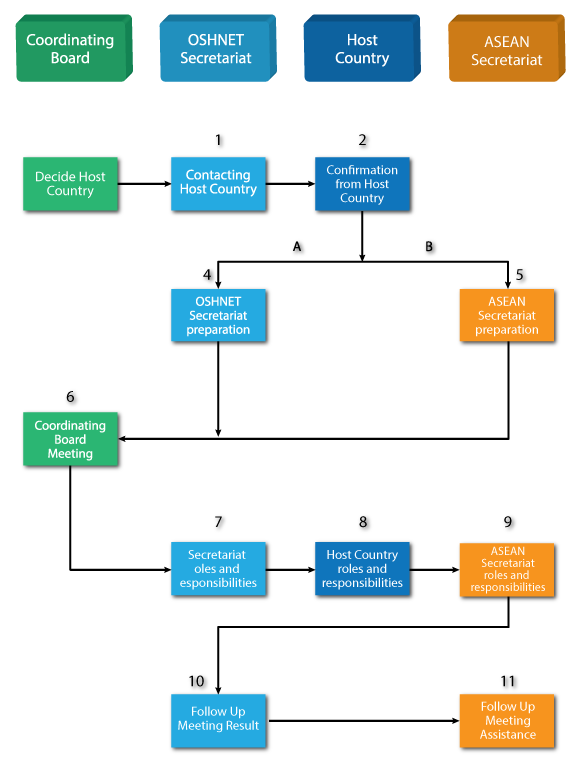 If the host country in their turn can't host the Coordinating Board Meeting because of some reasons, they should send the formal letter to ASEAN OSHNET Secretariat at least 1 month after the CBM. Automatically the next member country in alphabetical order will become the host country. The secretariat of ASEAN OSHNET send formal letter to host country for asking their confirmation to host the Coordinating Board Meeting for next period. Coordinate with the host country /institution for meeting preparations and arrangements (venue, room reservation, invitation and confirmation of participants, protocol services, if appropriate, etc. At least 3-4 weeks prior to the meeting, send out invitation letters to Member Countries, informing date and venue of meeting, and providing provisional agenda, programme of activities, general information and registration forms for participants. ii. Discussion Papers for the respective agenda items which includes progress of OSHNET activities, collaboration with interested donor agencies/countries, follow-up to the decisions of the previous meeting, etc? Coordinating Board Meeting is held according to the schedule and venue which already agreed by all member countries. Supervise the local support secretariat for documentation during the Meeting, and for compilation of the final report. Provide organising costs (meeting room venue, coffee breaks, lunch and local transportation). Provide the local secretariat for documentation during the Meeting, and for compilation of the final report? Arrange and provide field/local trip for participants, if appropriate. After the meeting, coordinate with Member Countries and the ASEAN Secretariat for relevant follow-up actions arising from the meeting. Prepare Press Releases for OSHNET activities, in coordination with Programme Area Coordinators? Seek funding from ASEAN Dialogue Partners and others. Assist OSHNET Secretariat in following up decisions of the meeting with Member Countries, as and when necessary.